The entire home-and-away season comes down to four quarters for West Coast, which can lock up a top-two spot with a victory over the much-improved Lions on Sunday. Despite losing to Melbourne on the weekend, the Eagles have secured a top-four position and double chance in the finals, but it can be so much better with four more premiership points. The Lions have won just five games this season, but with another five losses of seven points or fewer, they have been one of the competition's big improvers. They've troubled most teams at the Gabba, with midfield aces Dayne Beams and Dayne Zorko receiving outstanding support from second-season dynamos Hugh McCluggage and Jarrod Berry. 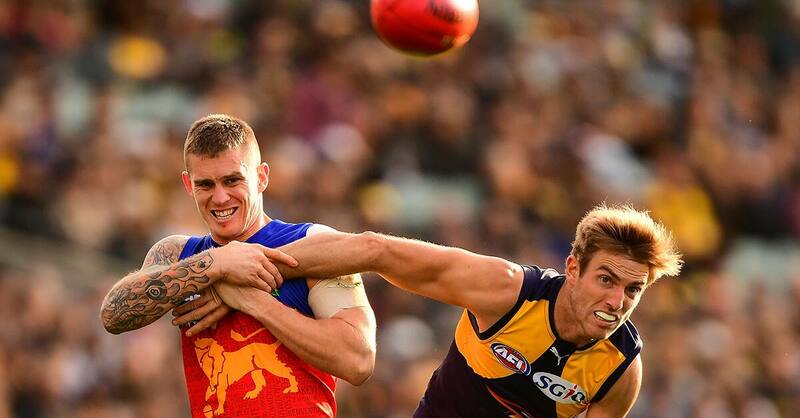 Despite their injury woes, West Coast have vowed to "throw the kitchen sink" at the Lions. Don't be surprised if the home team plays spoiler, but the consistent Eagles deserve slight favouritism. 1. West Coast has dominated Brisbane recently, winning the past seven matches, including four by more than 50 points. Brisbane has won just two of 10 at the Gabba in 2018, while West Coast has won six of nine matches interstate. 2. The Eagles are the lowest disposal team inside the top eight, and 17th overall averaging 357 a game. Brisbane is 12th for disposals with an average of 372.5. 3. The Lions are no stranger to tight finishes this season, playing in six games decided by seven points or fewer, for just one win. West Coast has won both of its games decided by single figures. 4. The Eagles are ranked fourth for scoring this season kicking 91 points a game, but the Lions have also scored consistently in 2018 with an average of 83 points. 5. Young defender Alex Witherden will miss the final round of the season after suffering a hamstring injury in Round 22. The Lions backline has lost two crucial players to injury in two weeks, with Darcy Gardiner suffering a shoulder injury and Alex Witherden injuring his hamstring. It will be a big week for Andrews as he looks to lead the Lions' backline. With West Coast's star forward Jack Darling on the cards to recover from a concussion in Round 22, the Andrews will need to be at his best.